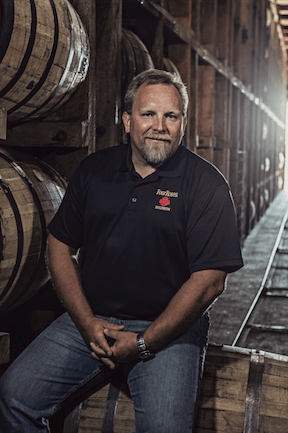 As the end of 2017 is growing closer, we thought it’d be a good time to sit down with Four Roses Chief Operating Officer Ryan Ashley to get the latest update on the major expansion of our Distillery in Lawrenceburg, Ky. Let’s take a look at what he had to say. What do you think will surprise visitors most when they make the trip to our Distillery once the expansion project is complete? Something I find most notable is how we’ve very carefully integrated the entire operation into the original Distillery and its supporting areas. For example, the Distillery that once housed a single cooker, beer still, doubler (pot still) and supporting yeast and lactic room will be home to two cookers, two beer stills, doublers and an expanded yeast and lactic growth room once the expansion is complete. The fermenter room will be twice as big, but completely integrated as well. Since we rely so heavily on our five proprietary yeast strains, after many decades, they have become an intricate part of the fermenter room walls, ceiling and floors, creating a “micro climate”. The fermenter room will be opened on three of its four walls and the new area built around it, allowing for the “micro climate” to permeate the new area and maintain the environment that provides so much of the flavor, character and different alcohols in each of our products. By taking the additional time and expense, we can ensure the highest quality and continuity that we demand and our consumers expect from all our products. Can you tell us a bit about how your team is working to preserve the historic nature and charm of the existing Distillery throughout the expansion? Not only do we pride ourselves on the uniqueness of our Bourbons, but also the unique style and feel of our Distillery’s buildings and grounds. The beautiful, Spanish mission-style Distillery building, listed on the National Register of Historic Places, is being kept in its true form, protected and maintained. To ensure this, we have partnered with Joseph & Joseph Architects, the very same architectural firm that designed the original building more than 100 years ago. The company is helping us enclose much of the industrial elements of the Distillery by having walls with the same roof lines and architectural details as the original building. The new construction will blend right into the existing to create a feeling of unity and continuity. Our valued employees and visitors should feel as though everything flows together as one building. What is the best part of spending your days at the Four Roses Distillery throughout this major project? While this is an incredibly exciting time, it is also very challenging project. Quite honestly, the best part is two-fold: First, knowing that our team will most likely never experience another expansion of our facility in our lifetimes—we are part of a very critical and beautiful project. Thankfully, each person on our team is dedicated, talented and passionate for every detail that will make this project a success. We operate as an integrated team. Secondly, and arguably most important, is being able to watch our efforts take shape. Most of us entered this business because we love to create and nurture this product throughout its life cycle. It is incredibly rewarding for us to leave such an impact on this historic site and Kentucky’s signature industry and of course, knowing it brings so much enjoyment to our consumers and loyal fans. What is the target date for the new facilities to be up and running? Our plan is to have everything operational by the beginning of 4th quarter 2018.